with scripture and prayer. This is the premiere collection of inspirational figures available today. 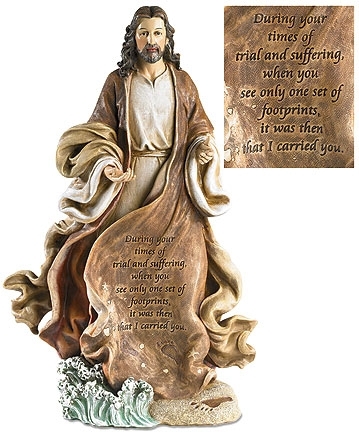 Full Inscription: During your times of trial and suffering, when you see only one set of footprints, it was then that I carried you. -- Foam/Cardstock/Ribbon -- 4 1/2 x 10" H -- Choking HazardWARNING CHOKING HAZARD - Item contains a small ball, small part, and/or marble. Not for children under three years.